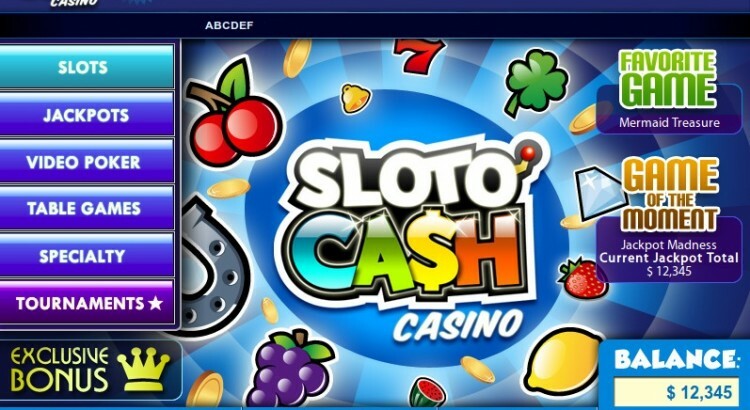 Slotocash is a new casino on the Rival software platform. For those of you who haven’t come across Rival software before, it is relatively new casino software that seems to have picked up a good reputation on the player forums.Â SlotoCash, licenced out of Curacao, and the only reason I foundÂ them is ‘cos IÂ recently metÂ one of the guys behind it. It’s too early to say whether or not Slotocash will make a big splash, and I tend to wait a year or so before recommending new casinos – I like to see them bed in, butÂ the fact I know one of the guys and the software plus it’s licencees, to date, have been above board and doing a pretty sound job, I think it’s worth mentioning. But I’d always advise players to proceed cautiously at a new casino and always read the T&C’s, no matter where you play. Slotocash accepts US players aswell as pretty much everyone else. The software does look pretty although there are only in the region of 50 games at present. This includes some video pokers, including Deuces Wild, Joker Poker, Aces & Faces and Deuces & Joker (plus JoB obviously!) and a number of fairly low-variance slots. Being low variance means lower risk, so expect longer sessions but lower payouts in general. Unless you get lucky!. There is a reasonable selection of bonus slots and free spins slots available too. Table games include Craps, Pai-Gow, Blackjack, Roulette (the crappy American 2-zero version and the better European single-zero version), Red Dog, Casino War, Caribbean Stud Poker, Baccarat, Let It Ride Poker and 3Card Poker. Probably one or two others by the time you read this. Answer me one question though: why would anyone want to play American poker when you have European poker side-by-side with half the house edge?! As I write, the signup bonus is a slots-only $100 100% match bonus and a range of banking options are supported, including Ecocard, Neteller, credit and debit cards, Ewallet Xpress, 900Pay, Moneybookers and bank wire. I’m told that the Reverse Pending time isÂ 24 hours so payouts would therefore be 24-48 hours one would assume. Hopefully they will also offer manual flushing at some point. Gimme My 15 Free Spins!